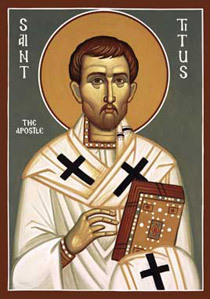 The Epistle to Titus is a book of the canonic New Testament, one of the three so-called "pastoral epistles" (with 1 Timothy and 2 Timothy). The Pastoral Epistles are often considered together, as each throws light upon the others. It is offered as a letter from Paul to the Apostle Titus. Its purpose is to describe the requirements and duties of elders and bishops. The author of Titus identifies himself as "Paul, a servant of God and an apostle of Jesus Christ. Scholars who believe Paul wrote Titus such as Donald Guthrie date its composition from the circumstance that it was written after Paul's visit to Crete (Titus 1:5). That visit could not be the one referred to in the Book of Acts 27:7, when Paul was on his voyage to Rome as a prisoner, and where he continued a prisoner for two years. Thus traditional exegesis supposes that after his release Paul sailed from Rome into Asia, passing Crete by the way, and that there he left Titus "to set in order the things that were wanting." Thence he would have gone to Ephesus, where he left Timothy, and from Ephesus to Macedonia, where he wrote the First Epistle to Timothy, and thence, according to the superscription of this epistle, to Nicopolis in Epirus, from which place he wrote to Titus, about 66 or 67. One of the secular peculiarities of the Epistle to Titus is the inclusion of text which has become known as the Epimenides paradox. According to the World English Bible translation, Titus 1:12-13 reads (in part) "One of them, a prophet of their own, said, 'Cretans are always liars, evil beasts, and idle gluttons.' This testimony is true." The statement by a member of a group that all members are liars is now a famous logic problem. In this section of the letter, Paul does not go after the character of the Cretans but rather makes observations of their false teachers. He leaves the character judgment of the people on Crete up to their own prophet.